2. 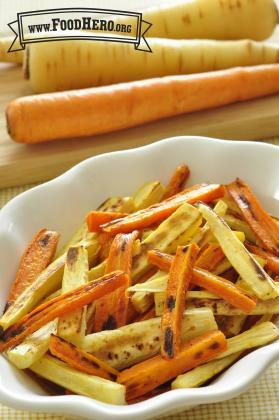 Cut the peeled parsnips and carrots into uniform pieces such as 3 inch x ½ inch sticks or 1 inch thick slices. 3. Place cut parsnips and carrots into a large bowl. Add the vegetable oil and stir to coat the carrots and parsnips. 4. In a small bowl stir together the salt, garlic powder and black pepper. Add to the carrots and parsnips and stir until the vegetables are well coated with seasonings. 5. Place vegetables in a single layer on large baking sheet being careful not to overcrowd the pan. Lining the baking sheet with foil or baking parchment will help with clean-up. 6. Roast in the preheated oven for 20-30 minutes, stirring the vegetables half way through the time. The carrots and parsnips should be caramelized to a medium brown and blistered.